Joe Johnson and his Miami Heat have made going from one of the league’s worst teams to a division leader, look so easy and effortless. In reality it was a lot of hard work that is paying off now. The Chicago Bulls are going in the other way. The last 7 1/2 weeks their fortunes have undegone an unlucky transformation, going from a team that was in it to win it, for Eastern Conference supremacy, to now a team that might just miss the playoffs. Johnson will hit the court for a home debut, and that’s what the Southeast Division-leading Miami Heat has been waiting for. Tomorrow night against a banged-up Bulls team, he’ll lead the charge and push a team possibly over the edge, that is already in danger of falling out of playoff position for the first time in two years. Johnson has had a lot of changes himself recently, as he found himself in the starting lineup against New York and helped Miami to a 98-81 win, two days after being waived by the Brooklyn Nets, following a contract buyout. Instead, Johnson was signed by the Miami Heat who are currently 33-26, only one night later. Looks like he felt the change was good, as Johnson knocked down a 3-pointer on his first shot as part of the Heat’s 13-2 start to that game. He finished with 12 points on 5-of-10 shooting, not bad for a fresh start. Johnson this season has 86 3-pointers. That’s five more than the total of Miami’s star 3-point shooter Chris Bosh, who is out right now due a blood clot that formed in his leg. With Bosh’s status unknown for the rest of the season, the Heat are in a tough spot trying hard to hold off Atlanta, which is a only half-game back. Johnson seems hungry since he hasn’t been part of a division-winning team since he played with the Phoenix Suns in 2005. The Bulls who hold a record of 30-28, are also swimming in unfamiliar and unfriendly waters. Since Jan 7., when they closed within 2 1/2 games of the conference-leading Cleveland Cavaliers, Chicago has gone a poor 8-16 to quickly fall in the standings to eighth-place, tied with the Charlotte Hornets and Detroit Pistons. The Bulls haven’t been outside the top eight in the East since Jan. 1, 2014. The positive note for the Heat is that they have won nine of 10 games against Eastern teams. That record started with an 89-84 victory in Chicago on Jan. 25, which was this season’s only previous matchup. 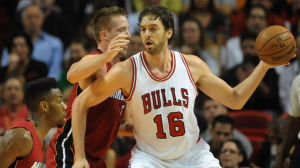 Wade had 28 points while the Bulls were held to 39.8 percent shooting. But can the Heat do that again, and at home? In that previous match up, Pau Gasol got 19 points and 17 rebounds, it’s also when star Derrick Rose after getting four points in the first-half, left the game with a lower back and right hamstring injury. Rose since then, has missed the last three games due to recurrent hamstring problems and is listed day to day. He joins other injured team mates; Jimmy Butler who has a strained left knee, Nikola Mirotic who had appendicitis, and Joakim Noah who has a shoulder injury. In that affair, Gasol stepped up his game again with his first triple-double of the season, recording 22 points, 16 rebounds and a career-high 14 assists. Doug McDermott got 18 points and has seen an increased in his minutes and has played an important role in their offense, averaging 19.6 points while hitting 10 of 20 3-point attempts in the last five games. 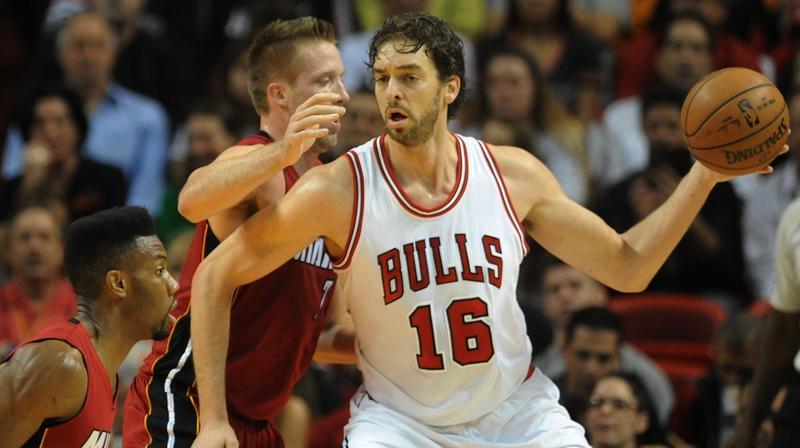 The Bulls have lost the last seven of eight road games, scoring 95 or fewer in each of the last three contests. Where as the Heat are 24-3 when holding opponents to under 96 points. That’s why we think Johnson and Wade have this one.